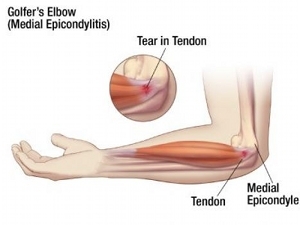 Golfer’s elbow (medial epicondylitis) is inflammation of the tendon that attaches to the inside of the elbow. These tendons are responsible for bending the wrist forward. This is less common than tennis elbow. Watch this video to find out about golfer’s elbow and tennis elbow! Chiropractic adjustments restore motion to the elbow joint and increase the range of motion. Ice and interferential current may be used to reduce the amount of inflammation in the area. ART is used to break up scar tissue and improve joint function. Stretching and strengthening exercises are incorporated into the treatment plan at the appropriate time to reduce the possibility of re-injury. The first step of massage therapy is to decrease inflammation. The second most important consideration is to reduce irritating adhesions, then increase circulation to compromised tissue, and then to maintain range of motion of the affected joint. Restoration of muscle strength and length are additional goals of massage therapy. Do you have a different kind of elbow pain? Is it on the outside? Check out our article about tennis elbow!